Use chalk to draw monster footprints leading up to your front door. Create an easy tulle monster wreath to welcome your spooked guests. Make monster feet out of green poster board and have them go from the front door to the party room. Use green and blue for decorations such as streamers and balloons. Switch out the light bulbs in the party room from clear to green or blue. For an older crowd: Make a sign for the front door that says “Beware of monsters! Enter at your own risk!” Rent or borrow a fog machine to create a creepy monster atmosphere. Make monster hands. Stuff clear plastic gloves with tissue paper. Tie them closed with black ribbon, and decorate with scars, ghoulish nail polish and big, gaudy rings. Use them as table toppers, or group some together to form a creepy centerpiece. Play monster music like The Monster Mash, the theme from The Munsters, Monster in the Mirror, Purple People Eater, and The Werewolves of London. Make monster heads out of empty gallon milk jugs. Clean them out well, turn them upside down, and paint to look like your favorite monsters! Place them around the party room, or group them together in a drinks tub. Make a banner that says “Welcome to (your child’s name) Monster Mansion”. 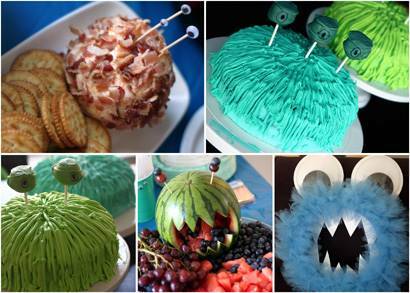 Serve ordinary party food, but give the foods monster names and glue googly eyes to toothpicks to stick in foods. Melon balls can be monster eyeballs, mini pigs in a blanket become monster toes, spaghetti with sauce turns into monster brains, make signs for each item to keep the children entertained while they eat. Carve a monster mouth into a watermelon to use as the centerpiece of a fruit salad. Serve monster fingers, baby carrots with a dab on cream cheese on the end. Put an almond slice into the cream cheese to make a fingernail. Make monster hands filled with popcorn. Using clear plastic gloves, fill with popcorn, and tie closed with a ribbon. Stack them in a bowl or on a platter. Serve monster toe cookies along with the cake. Use sugar cookie dough that you’ve tinted green with food coloring. Roll the dough into ½ inch ovals; roll the ovals in plain sugar. Place on a cookie sheet. Press an oval shaped candy, like a black jellybean, onto one end for the toenail. Bake according to recipe directions. A monster layer cake is easy to make, and looks suitably creepy. Bake a chocolate layer cake in two pans that are the same size. Once the cakes are cool, spread a thin layer of green or blue tinted frosting on the stacked cakes. Then using a piping bag, create a furry look by squeezing more icing onto the cakes. If you’re feeling extra crafty whip up a batch of monster eye cake pops to stick into the cake as well. Turn any traditional game into a monster-themed game, pin the eye on the monster, tossing bean bags into a cardboard monster’s open mouth, the possibilities are endless. Fill bright green or blue paper bags with goodies and glue or draw on a monster eyeball to the outside of each bag.